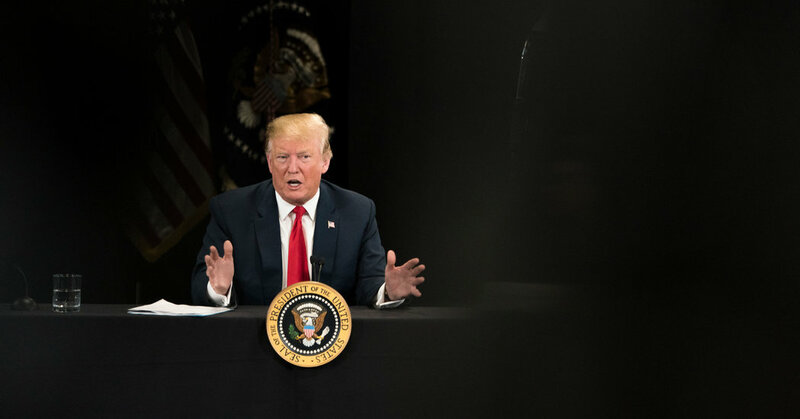 WASHINGTON — As he awaits the Thursday release of the redacted special counsel report on his 2016 campaign’s ties to Russia, President Trump is filling his idle moments — and blowing off any anticipatory steam — by turning to a familiar pastime: television. In speeches, in interviews and on Twitter this week, the president has returned to his comfortable role of town crier and news wire as he opines on the news developments of the day. Bernie Sanders, a prospective Democratic challenger for the presidency, appeared on Fox News: Weird, the president tweeted on Tuesday, adding that it was odd that “we” — meaning he and Fox News — had brought the Democratic strategist Donna Brazile into the channel’s Trump-friendly fold of cable contributors. Cher, the singer and frequent Trump critic who uses a toilet emoji when referring to the president, disliked the White House’s proposed plan to transport undocumented migrants to sanctuary cities, saying Los Angeles already had people in poverty it could not take care of. “I finally agree with @Cher!” Mr. Trump exclaimed to 59 million Twitter followers. In addition to his running commentary, Mr. Trump has taken up the role of play-by-play announcer. He first weighed in on the fire that engulfed Notre-Dame, the French cathedral and international symbol of resilience and faith, by suggesting that flying tankers drop water on the 800-year-old structure. The French authorities responded with a pointed English-language statement to say that the building, already buckling under the weight of crumbling wooden beams and limestone, would have been destroyed if that advice had been followed. Mr. Trump has always enjoyed providing his own unique interpretation of the day’s news, in part because for years before coming to Washington he saw himself as a part of the media, first as a tabloid fixture in New York City and then as a cable commentator and reality-television star. Randal Pinkett, the chairman of BCT Partners, a consulting firm, and winner of season four of “The Apprentice,” recalled in an interview that Mr. Trump was “obsessed with media” and constantly reminded people around him that the show was No. 1 (though it did not crack the top 20). Now in the White House, Mr. Trump’s delight in being the first to share information is palpable. “Don’t you enjoy being the first person to scoop someone?” said Anthony Scaramucci, who served for 11 days as the White House communications director. “For many years he felt that there was no separation between his brand and the media, that there was an intersection of value for himself personally between his brand and saturating it in the media,” Mr. Scaramucci said. Get updates from our reporters as they discover key findings in the report on Thursday. Mr. Trump spent decades sharpening his ability to manipulate and create his own news cycles, sometimes in pioneering ways. Years before running for president, Mr. Trump frequently used the six-second social media video platform Vine to weigh in on topics such as Miley Cyrus and the former Democratic congressman Anthony D. Weiner — “No perverts!” Mr. Trump exclaimed one day from his private jet. As a presidential candidate, Mr. Trump was often described by aides as a sophisticated version of a parrot, given his penchant for repeating information almost unfiltered, as soon as he had processed it. As president, Mr. Trump — who has shaped the White House communications operation around his belief that he is his own best messenger — has acted as both reporter and participant. When Tiger Woods clinched the Masters golf tournament on Sunday, Mr. Trump, who spent the day inviting Americans to watch — “Very exciting, tune in!” — announced he would award Mr. Woods the Presidential Medal of Freedom. Boris Epshteyn, now a political commentator at Sinclair Broadcast Group who also served as a special assistant to Mr. Trump, said he used “the most powerful loudspeaker in the world” now that he had it. For all of the mystery surrounding Mr. Trump’s uses of his unscheduled hours, some aides privately concede that a large portion of that time is spent with a television on in the background. When he eats lunch in his dining room with visitors, a TV is usually on, either turned down or muted, until there is something he wants to hear. When he travels on Air Force One, he toggles between the Golf Channel and Fox News. The morning hours blocked off for unstructured executive time are often interspaced with tweets responding to television commentary on Mr. Mueller’s report. Mo Elleithee, the executive director of the Georgetown Institute of Politics and Public Service and a former spokesman for the Democratic National Committee, said Mr. Trump’s insistence on inserting himself into a wide variety of stories — some of which are about his potential 2020 opponents and not the White House — may be the president’s way of trying to wrestle back attention from a crowded field.